Nestled away in a prime hilltop location, Villa Phala 3 overlooks a stunning landscape: in the daytime, you’ll enjoy vistas of the Andaman Sea and tropical greenery, and after dusk, the glittering night lights of Patong are aglow in the distance. Containing four bedrooms, sun-dappled outdoor spaces and finely appointed interiors, Villa Phala 3 is ideally kitted out for groups of nine. 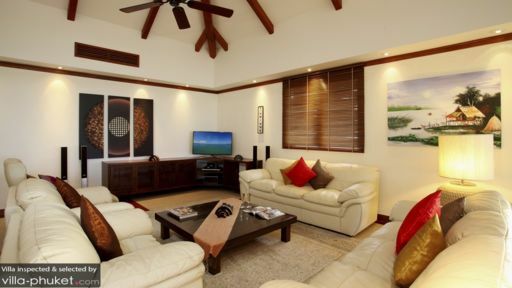 The villa is a great bet for vacationers seeking a restful getaway that offers ultimate privacy, yet is located within proximity to local amenities and attractions. Nine guests are accommodated in four bedrooms. Spacious and wood-clad, each of the rooms feel welcoming and are kitted out with modern amenities. Both master bedrooms feature king beds (may be converted into twin singles in one of the rooms), sun-drenched balconies and en suites with double vanities, toilets, shower alcoves and whirlpool bath tubs. Of the two guest bedrooms, one is furnished with twin singles and a bunk bed (a great option for young children), while the other contains twin singles. Both rooms feature private en suites with double vanities, toilets and shower alcoves. 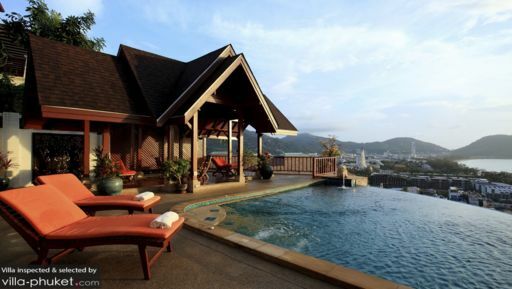 An infinity pool, flanked by recliners and a Thai-style pavilion curves around the edge of the villa. This is a prime spot for taking in the surrounding scenery - the views out to the Andaman Sea are absolutely breathtaking. Away from the pool area, a spacious, breezy terrace is where vacationers gather for al fresco meals and outdoor lounging. As part of the L’Orchidée Residences, guests at Villa Phala 3 share access to the estate’s common area, which features a pool, kid’s pool, pétanque court, fitness centre with sauna and convenience store. Also available for use is free shuttle bus service that runs between your villa and the entrance of the estate. The living spaces at Villa Phala 3 are spread out across two storeys; the first floor houses the bedrooms, while communal areas are set on the upper floor. Set in an open-plan layout, the lounge, dining area and kitchen flow seamlessly into one another in a generously proportioned room. The décor is a mix of traditional Thai and modern design elements: Lanna-style architectural details blend in well with a neutral colour scheme and contemporary furnishings. An elegant dark wood dining set seats 12, the lounge is outfitted with sofas, 42-inch plasma TV with DVD player and sound system and the open-plan kitchen comes kitted with an island counter and a full range of cooking appliances. An on-site team comprising of a villa manager, butler and housekeeping staff ensure that all your holiday needs are well taken care of. Airport transfers are also included with your stay. Energetic and bustling, Patong has garnered a reputation for being the island’s tourist hotspot. There is almost always a constant flurry of activity, whether you’re at the beach, visiting the shops or soaking up the town’s vibrant nightlife vibes. Patong Beach, located 10 minutes’ walk from your villa boasts a lively ambience. Seafront dining venues and nightlife hangouts are aplenty here, making the beach a popular to-go venue among travellers. Away from the beach, there are gigantic shopping complexes, luxury spa parlours, cooking schools and family-friendly entertainment amenities, like Surf House, Flying Hanuman, Phuket Wake Park and Patong Go-Kart Speedway. In-villa massages, as well as yoga and cooking classes may be arranged at your request. Dining options are plentiful, thanks to the wide-ranging variety of establishments in the vicinity. Places like La Gritta, Lim’s Restaurant, Le Versace, Paradise Beach Club and Wassa Homemade Bar are just 15 minutes’ drive away. 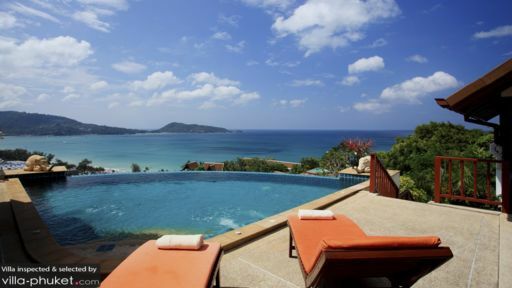 Kalim Bay, located about a five-minute drive away boasts a selection of fine dining restaurants.